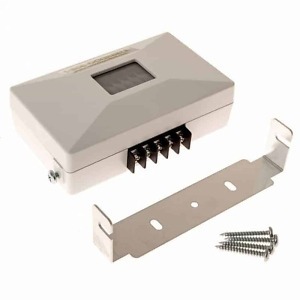 Easy to set up and install this window/door chime alert. Play 1 of 8 songs on this small, compact plug in receiver/speaker. Sister product to the RC3260. This unit has a smaller speaker and plays eight tunes versus 13. Great for residential use, or over a small distance, the RC3260 is a wireless entry alert by Carlon. The transmitters are small wireless door/window contacts that easily attach to a door or window. 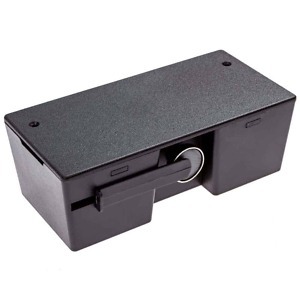 The receiver plugs into a standard wall outlet. This product is also compatible with other Carlon wireless push buttons and receivers. The RC3760D is an economical, easy to use and set up windows or door alarm. Rather than playing a loud alarm sound, the plug in receiver/speaker plays one of eight chimes which are changeable at the sensor/transmitter. When the magnetic contacts attached to a door or window are separated (the door or window opens) the transmitter sends a wireless signal to the plug in receiver to play the pre-selected chime sound. This is a great system to monitor or alert you when the door, window, or even cabinet is opened. For example, suppose you have a supply closet in your office you want to monitor. When the door is opened, it will play a chime sound. The maximum operating distance of the product, from the transmitters to the receiver is 150 ft. Environmental factors such as walls, doors, concrete, etc. will reduce the transmitted range. If the distance from the transmitter for the receiver is over 100ft., we would recommend the DA50L-A. Up To 150` Operating Range. For longer distances, see the DA50L-A. Really like the door bell I ordered from you. It alerts me that someone is coming into the front door of my office !!! I like the fact that it is a soft chime and can be located in my office several feet away, from the front door. Thanks!!! Product works great throughout a mid sized office. Product works great throughout a mid sized office. Having the choice of bell chimes is nice. There are even holiday related ones which is interesting. Overall, great buy!